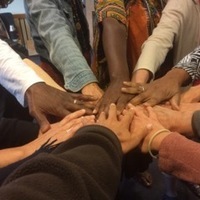 InterPlay’s approach reconnects people to the wisdom of the body, fostering community, ease, and grace among people from all walks of life. Many discover that magic happens when we can tell our stories, sing our songs, and dance in love and service. Train and mentor leaders to share InterPlay in their communities and work. Support initiatives like Sustaining International Sisters (SIS), a global sisterhood community in Atlanta.